Customer Aligned Value Selling (CAVS?) is what I’ve been about for a long time. 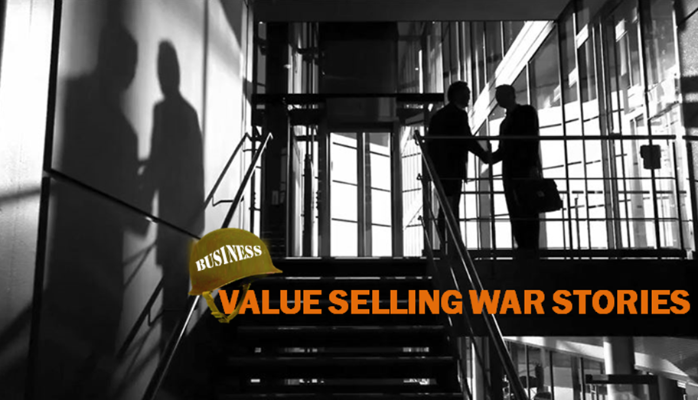 As a Founding Member of the Value Selling and Realization Council, I’m often asked for anecdotal stories that line up on the situations we face in today’s B2B selling environment. How do your experiences relate to Challenger? What’s the difference from a playbook? What does it mean when we are often 60% of the way (or more) through a prospect’s buying process? Etc, etc, etc. So I’ve compiled dozens of experiences and will be sharing one every week or so. It’ll take a year. Some are good, some are bad, some are phenomenal. To note…I mean no disrespect to the brave men and women who serve and have served in the military. Theirs are the true “war stories”, ours as sellers matter not in comparison. But it is our occupation, and our stories matter. I hope you’ll enjoy, share, comment on and maybe even benefit from them. If you have a particular situation, hit me at ceo@decisionlink.com and I’ll see if I can help with a relevant example, experience or thoughts. To learn more on the latest thinking and approaches to Value Selling and Realization, attend the the world’s first VSR Value Summit in Dallas on 29-Feb and 1-Mar. 2016, Over 100 value leaders and practitioners will convene to share their best practices, methods and to network. You can sign up at VSR Summit. ABOUT THE AUTHOR: Jim Berryhill is Co-Founder/CEO of DecisionLink. Jim has extensive experience in sales and executive management, in roles from individual contributor to leading sales organizations with several hundred sales professionals and $1 billion in revenue. An ardent believer in customer aligned value selling, Jim founded DecisionLink to bring automation and systemic support to what should be a core business function for all B2B organizations.